The RHS Chelsea Flower Show is one of the main highlights in my floral calendar. 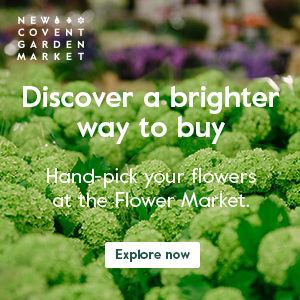 But this year will be extra special as for the very first time, New Covent Garden Flower Market will be exhibiting at the show! Titled ‘Behind every great florist’, their exhibit is the story of two sides bound together : London’s famous wholesale Flower Market on one side and its customers, independent florists, on the other. Floral Design and Event company, Veevers Carter are creating the stand and pictured above is the most recent artwork from their creative team. It shows the Market side as a three metre high wall of black Market-style buckets, each densely packed with flowers and foliage in a restrained palette of green and white. Philadelphus, freesias, arum lilies, hydrangeas, lilies, guelder rose, lilac, freesias, tulips, phlox, lisianthus, anemones, hyacinths, carnations, roses, spray roses, gerberas, alstroemeria, euonymus, chrysanthemums, chincherinchee, skimmia, camellia and more besides will be featured. Towards the centre of the Market wall, you can see above that the black buckets are ‘pulled’ into a central break, travelling through a core that depicts the designers’ ‘creative thought space’. The flowers on the opposite facade, the florists’ side, then erupt in a riot of colour in homage to every great florist. The mystery of the image on the florists’ side will remain a closely guarded secret until the RHS Chelsea Flower Show itself! 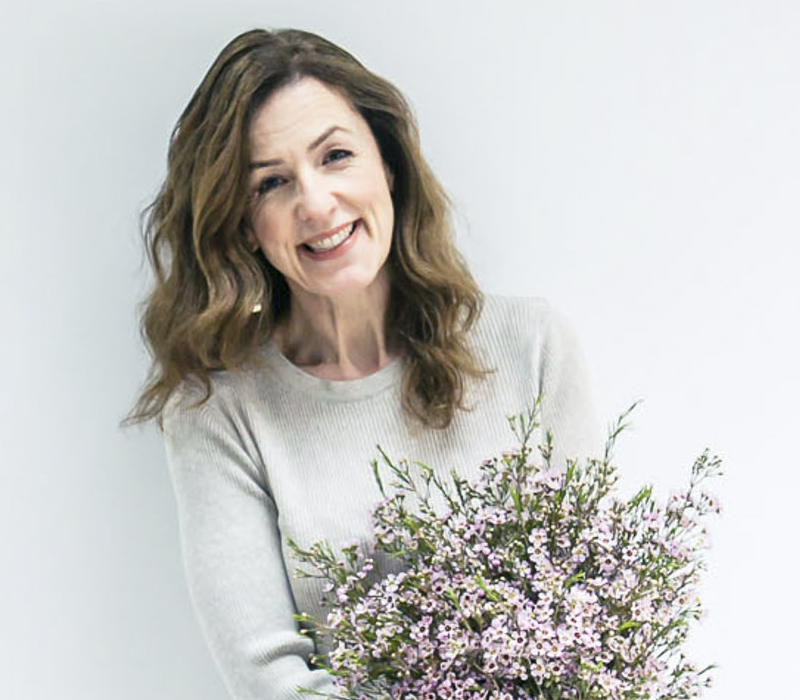 On the florists’ wall, Veevers Carter intend to create each layer as a scented tapestry of flowers, using cut materials from all over the world to include hydrangeas, delphiniums, gladioli, senecio, camellia, anemones, lilac, carnations, lisianthus, gentians, phlox, tulips, gerberas, sweet williams, bouvardia, roses, chrysanthemums, freesias, ranunculus, alstroemeria, lilies, snapdragons, hyacinths and arum lilies. The two sides of the story are bound together by a mass of coloured ribbons, representing the strong bond…both professional and personal…between the Market and its community of professional, independent florists. 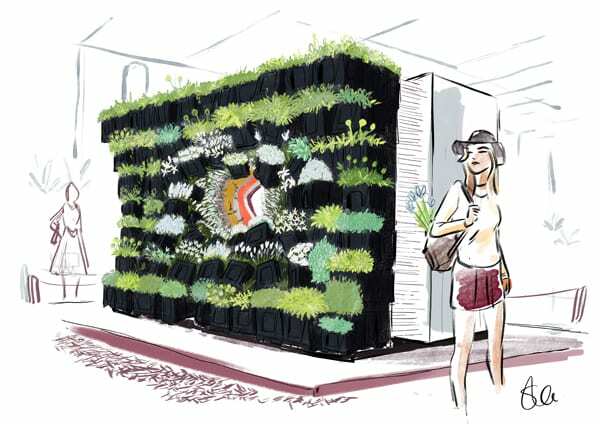 So, if you visit the RHS Chelsea Flower Show this year, do make a beeline for the exhibit. It will be staged on a prominent island site in the Great Pavilion, just off Main Avenue. If you have a catalogue, you can find it marked on the plan as GPB127. P.S. The RHS Chelsea Flower Show is taking place from May 24th-28th. Tickets always sell out before the show starts, so if you’d like to go, make sure you book asap!